“Army feared King, secretly watched him, Spying on blacks started 75 years ago” describes how from the review of thousands of government documents and interviews with people involved in the spying revealed that by early 1968 U.S. Army Intelligence regarded King as a major threat to national security. 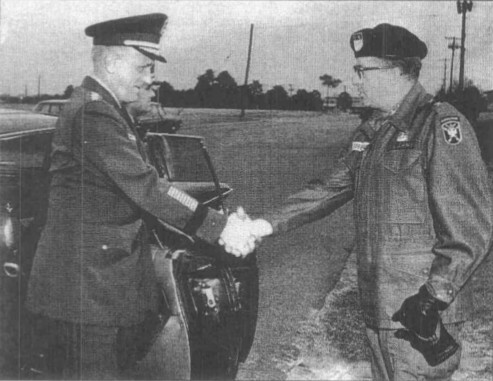 Maj. Gen. William P. Yarborough (right) greets Gen. Harold Johnson outside the John F. Kennedy Special Warfare School at Fort Bragg, N.C. Johnson later would be Army chief of staff and Yarborough his assistant chief of staff for intelligence. Army spying on civilians expanded in the ’60s because the FBI and local police forces proved unreliable, according to the man who was the Army’s top spy in 1966-68. But Lt. Gen. William Pelham Yarborough, who became Army assistant chief of staff for intelligence in December 1966, also was motivated by a deeper concern that anarchy and treason lay behind the anti-war and civil rights movements. In a two-hour interview at his North Carolina home, Yarborough defended Army Intelligence’s role in spying on Dr. Martin Luther King Jr. and other Americans and said he never authorized anything illegal. “If it was completely illegal or un-American, we would have turned in our suits,” he said. It had been illegal since 1958 for the Army to spy on American citizens at home, but Yarborough said the FBI, which was responsible for counterintelligence inside the United States, needed help as civil unrest spread. But military records and interviews with former staff members show Yarborough was convinced that Army Intelligence was engaged in a war with Communists for the minds of Americans. “This is a war of ideology and persuasion,” he told Gen. William C. Westmoreland in a February 1968 letter about the protests that had begun sweeping the country. Westmoreland, who commanded U.S. forces in Vietnam from 1965-68, was a West Point classmate, 1936, as was Gen. Creighton Abrams, who commanded U.S. forces in Vietnam after Westmoreland. Yarborough’s career clearly prepared him for this war. The son of Col. Leroy W. Yarborough, an Army Intelligence officer who served in the Far East from 1918-22, William Yarborough served as an Airborne regimental commander during World War II; deputy director of the Army assistance operations in Cambodia, 1956-57; and commander of the 66th Military Intelligence Group in Stuttgart, Germany, 1958-59, where he worked with legendary spymasters Roger Hilsman and Ed Lansdale. From 1961-65, he commanded the John F. Kennedy Center for Special Warfare at Fort Bragg, N.C. — the Green Berets school. While there, he argued that his elite Special Forces commandoes and Army Intelligence could “mutually support” one another in “counterinsurgency operations both foreign and domestic,” according to letters he wrote to Maj. Gen. Garrison B. Coverdale, commander of the U.S. Army Intelligence Center at Port Holabird, Md. During Yarborough’s tenure as assistant chief of staff for intelligence, Army Intelligence made frequent use of Green Beret troops in domestic spying. Yarborough’s opinion of antiwar protesters comes across clearly in this excerpt from an interview conducted by two Army historians shortly after his retirement in 1975. The general described “the burning of Washington, the siege of the Pentagon” during an October 1967 anti-war march on the Pentagon. “I can assure you it was a sight to make you stop to think,” he said. Army Chief of Staff Harold Johnson and Defense Secretary Robert McNamara also were on the roof, Yarborough remembered. Yarborough knew: He doubled his intelligence-gathering efforts against King and his supporters. “We had some reason to feel outside influences were aiding and abetting those who had a legitimate right (to protest) inside the U.S., and this became the reason to try and invoke more sophisticated means to find out who was doing what,” Yarborough told The Commercial Appeal. Yet, Yarborough told The Commercial Appeal, “We were not totalitarians. We were not trying to do our fellow Americans in. We were trying to help the agencies of the government keep law and order so that rational solutions could be reached.